This delicately crafted sterling silver, 9ct rose gold and diamond ring perfectly captures the beauty of the flowers that graces the rocky gardens of Wales. All Clogau Welsh jewellery contains a touch of gold mined from the Clogau St David's gold mine - the very same gold used in generations of royal jewellery. Each item of Clogau jewellery contains a touch of rare Welsh gold. Clogau Lady Snowdon Diamond Ring is rated 3.0 out of 5 by 1. 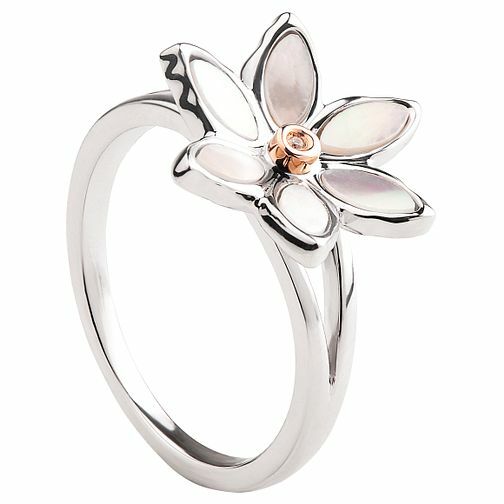 Rated 3 out of 5 by Anonymous from Nice ring Product description doesn’t say the petals are mother of pearl. Had to order my size so had to wait a while. Would have preferred all silver but it’s personal preference.